From director Sergio Corbucci comes a “spaghetti” western I have long heard of and finally got the chance to see for myself. Generally when I have come across a comment or article about this title it is spoken about with great reverence by the few who have seen it. 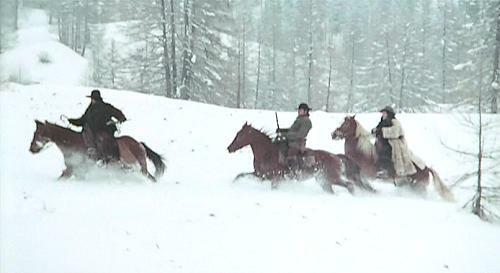 From the outset the one thing that helps to differentiate this film from not only Italian westerns but most of those from Hollywood as well is the fact that the entire film is snowbound. For the English dubbed print we have a lone rider approaching in the distance through a snow covered valley. 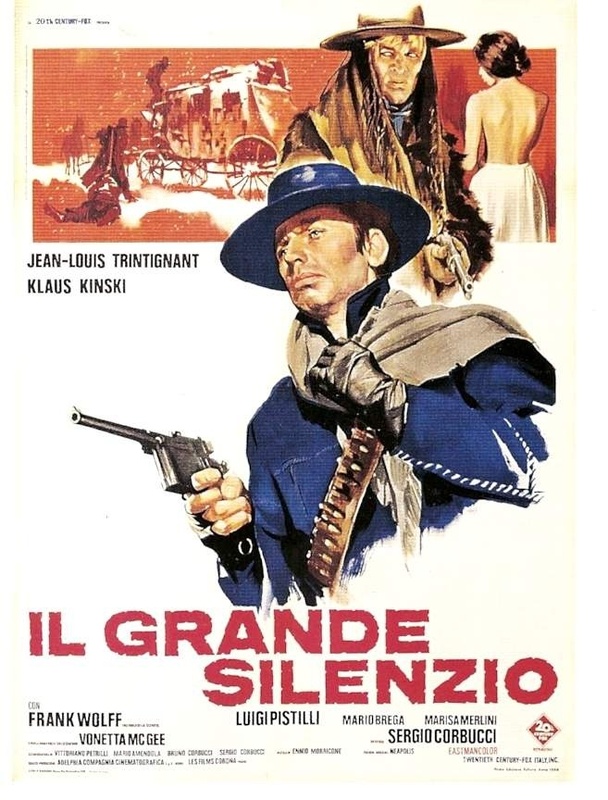 Men are waiting ahead hidden behind mounds of snow but like many of Leone’s gunmen they all wind up dead at the hands of top billed Jean-Louis Trintignant. Once he has shot down his would be attackers a group of mountain dwellers emerge and begin to strip the dead of their boots and whatever else may be of value. It seems that the mountain folk are not welcome in Snow Hill, the town below. The reasons are both political which will play out between the bounty hunters and an unscrupulous banker as well as their stealing supplies in order to survive the harshest of winters. Sheriff Frank Wolff will discover this first hand when he is held up strictly for his horse. Not for riding either. They want the horse for meat to feed the starving. 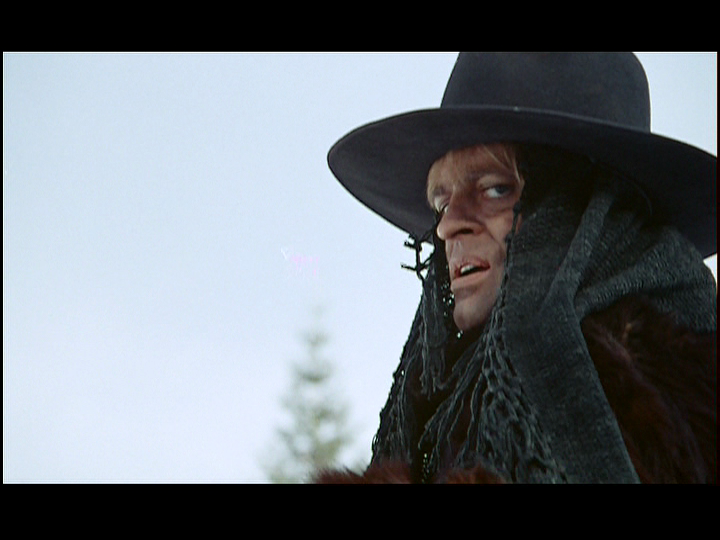 Preying upon the mountain folk is bounty hunter Klaus Kinski. Klaus turns in a first rate performance here as both a sadistic killer as well as an extremely smart and calculating villain. He’ll come into contact with our hero Trintignant on several occasions as they drift towards the inevitable showdown. 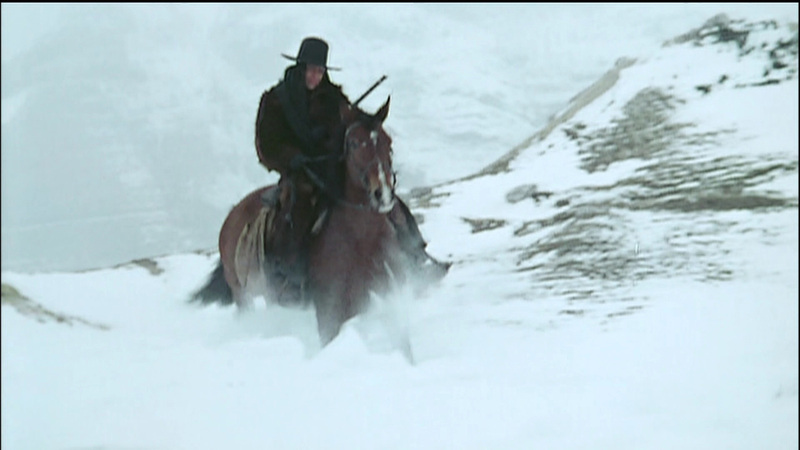 While Klaus is collecting bodies in the snow covered mountain tops, the imagery of this unique western is quite striking or haunting if you prefer. While hitching a ride by stagecoach he hauls frozen bodies to the rooftop while making his way to town to claim his bounty from sheriff Wolff. Spoken by Vonetta McGee in reference to Trintignant’s avenging angel of death. 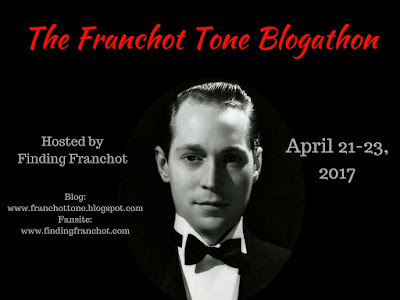 Like the character Harmonica in Leone’s Once Upon a Time in the West, Trintignant is a character with a past that will unfold as the film moves along. While Eastwood rarely speaks in his trio of Italian westerns Trintignant is actually a mute avenger with a secret beneath the high collar he wears and the heavy growth of stubble covering his face. When Kinski slyly kills Vonetta’s husband she appeals to our mute hero to lure Kinski into a gunfight and end his sadistic reign of violence. Just who are actually the outlaws in this film is a contentious topic. 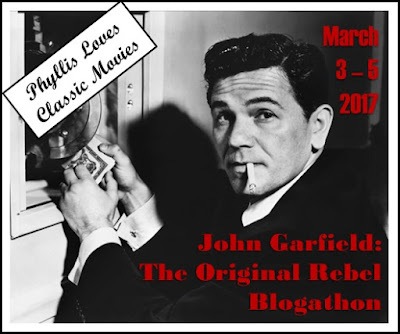 As the film heads towards the customary showdown between our two leading men it’s a violent ride that only escalates at the fade out. This is a bleak tale and unforgiving in it’s delivery. While I found some of the camera shots a bit “off” the overall impact of the snowbound settings are quite haunting with the mist settling in and the lone rider shots from a distance creating a feeling of isolation. At times the mountain folk are almost ghostlike in their sudden appearances from the snow covered caps. Despite the fact that the dubbed version I saw had Klaus Kinski being dubbed (which I am always complaining about) his performance here is far better than many of the other numerous flicks he populated during the era. 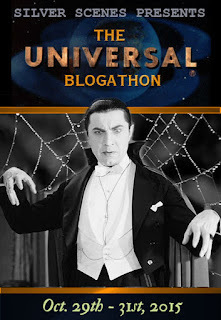 For more on Klaus and his impact on camera click here. Frank Wolff plays the sheriff in somewhat of a buffoon style which I wasn’t fond of though it should be pointed out that may be a case of the dubbing and a loss in translation. For those unaccustomed with the heavily mustached actor, he played the ill fated Frank McBain in Once Upon a Time In the West. Once again it’s Ennio Morricone delivering the goods with a solid score that perfectly fits into the era of the spaghetti western. 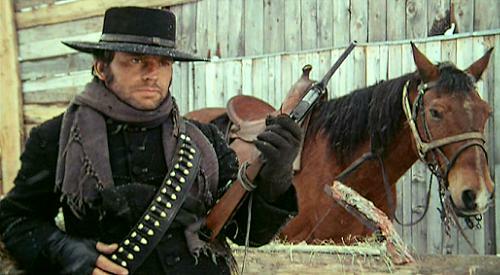 Director Corbucci had already done the influential Django with Franco Nero as well as some other popular made in Italy westerns including Minnesota Clay before moving on to this off beat outing. He would also turn in others oaters including The Mercenary and Companeros. 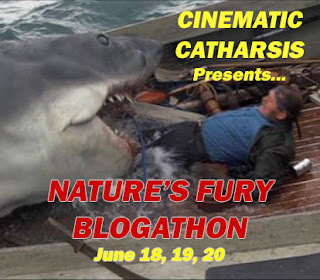 Both of which featured Nero and an over the top Jack Palance. It’s safe to say that Leone gets the praise on a worldwide plain yet this like the other titles mentioned by Corbucci are worth looking into for an alternative style to Sergio’s Italian western efforts. It’s nice to see this has turned up in a restored bluray edition since the time of this writing so I’m looking forward to a rewatch. Excellent review (and a reminder that I need to pick up that Blu-Ray one of these days). 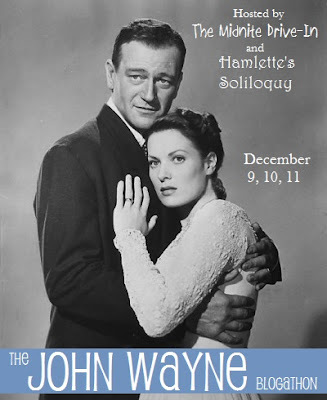 Have you seen Robert Hossein’s downbeat Cemetery Without Crosses (The Rope & The Colt)? That’s another great cult western worth tracking down. Also recommended is Day of Anger with Lee Van Cleef. Both films got recent Blu-Ray/DVD releases from Arrow Video/MVD Entertainment. Thanks. I too need a blu ray of Great Silence. Want to see a pristine version. I haven’t seen the Hossein flick but have now added it to my list. Day of Anger is pricy at the moment so waiting a bargain. I do so wish Kinski did his own dubbing in these flicks though! A favorite actor of mine. I can’t think why I’ve missed this movie — must look out for it. Many thanks for a great writeup. There is 2 part posting on youtube. Well, if you ever want to borrow both of those Blu-Rays (DoA and CWC), let me know. They’re currently loaned out to a friend with a few other Arrow releases, but I expect them back in about two weeks.